The apartment in which Felipe Betancur lives is crammed with objects that, seemingly, are not useful in practical life: Play Station controls that do not work, basketballs cut in half, pvc tubes. The desk, where Felipe works for hours, is flooded with colorful and curious gadgets, like a mouse that is operated with the foot. The site, in short, seems like the laboratory in which an inventor, in long and feverish days, lost his reason in search of an invention that would give him glory. But it’s not like that. Felipe Betancur has been working for years to create objects that can make life easier for people who have some kind of disability. So far he has achieved 150 developments for these people. But the work continues and the goal is to present 80 new inventions to the contest ‘Low cost technical aids’, in Spain, which is open until June 15. That’s why Felipe works marathon hours, from 8 in the morning until 10 at night. At the moment he is working in a wheelchair for children, because he says he has not seen this product in the Colombian market. Control of television for people with little mobility. Another of his classic inventions, such as the mouse for the foot, is a mechanism to use the keyboard for people who do not have mobility in their hands. The person puts on a cap and this, in turn, has a thin tube with which, by moving the head, you can type easily. The idea of helping people with disabilities did not arise spontaneously from Felipe’s head, but rather slowly and steadily. “I’ve always been a lover of technology, of MacGyver’s inventiveness. In school, when we did the science fair, I invented things that I then sold to my colleagues,” he says. For 14 years he worked making sales over the internet. 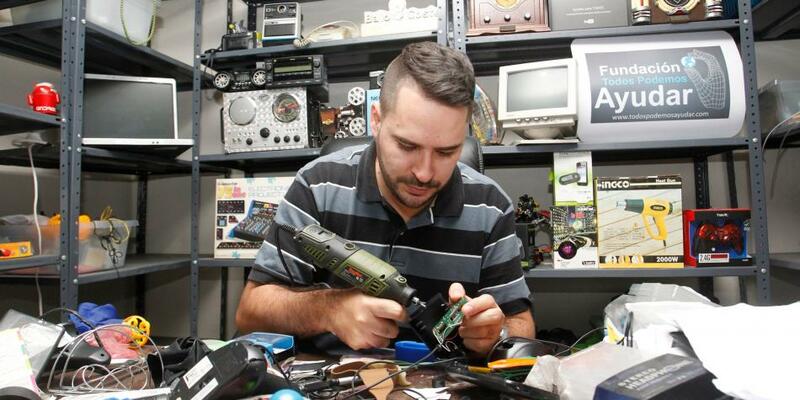 He brought strange and curious gadgets from China and sold them to his customers in Medellin. Now, for example, he has a clock that with a button serves as a lighter. With pride, he says he brought it from China and that it is worth no more than two dollars. But over the years he became disenchanted with sales; he did not find more meaning in mercantilism. “I felt I needed to help people,” he says. Then he toured the neighborhoods of the city taking gifts to children, organizing health days for adults. This laudable work left him full of satisfaction, but the feeling was not complete. “We went there one day and we took the doctors to examine them, but the thing stayed there. So, I started asking myself what was wrong with these people. It was just a day of help, then what? ” reflects Felipe. One of the inventions is a spoon that allows you to eat autonomously, for people with reduced mobility. At that time, together with two other people, he created the foundation ‘We can help’. The idea was that each person could contribute from their knowledge. This is how Felipe understood how he could help people in a more constant and profound way. He put the use of technology and his inventiveness at the service of the people and achieved his first invention: the mouse that is handled with the foot. “It’s very simple and cheap, I just took a ladle and opened a hole in the mouse. In this way the person can manage the computer and does not have to invest $ 4,000 which is the price of bringing a device for this purpose from the United States, ” explains Felipe. That is the main difference between their inventions and those that are already in the market. A ball for the blind brought from abroad, which is where they are manufactured, costs 1,200 dollars. He, with a ball and some bells, manages to make one for about 15,000 pesos. Being ingenious, and with the desire to help people, led him to travel to 121 municipalities of the department. In them, he did training to teach people how to help people with disabilities. He says that for six years he traveled through the remotest municipalities, places where poor conditions and untamed nature make life much more difficult. In those territories he dictated workshops and could know ‘real Colombia’, as he says. With this creation, blind people can practice their skills with touch. As a result of this titanic work, another project was launched to help the population with disabilities: a mobile application that serves as a guide to deal with the different disabilities. For example, the 10 most important tips to help a mute person, or a person who cannot see. The main audience for the application will be school teachers. Felipe, with the aim of reaching more people, opened a YouTube account a few years ago, in which he exhibits his inventions and shows training to help the disabled. The account ‘We can all help’ already has 187,000 followers. But, despite his ingenuity, he has not patented any of the 150 developments. “I do social innovation, what matters to me are the people, not the money,” he concludes.